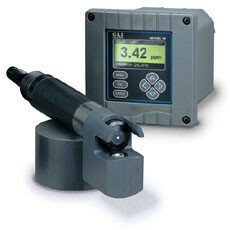 The Model D53 from GLI International Inc., of Milwaukee, is a full-featured, easy-to-use, Dissolved Oxygen Analyzer offering a second sensor input to enable independent monitoring and control of two membrane sensors. It includes an RS-232 output, optional HART communication capability and provides four field-configurable relays. The sensor features a replaceable membrane cartridge, simplifying the delicate and time-consuming task of installing a new membrane.